I have an available supply. The market down the road has the best in town, and sometimes the market has it on sale. I can stock up when that is the case. I can freeze it so I will never run out. I always have it on hand. I have been able to maintain a somewhat healthy weight while on my cheesecake only diet. Well, sort of. A healthy weight is a relative term. As long as I exercise and still fit in my sweatpants, that’s fine with me. I like my sweatpants. 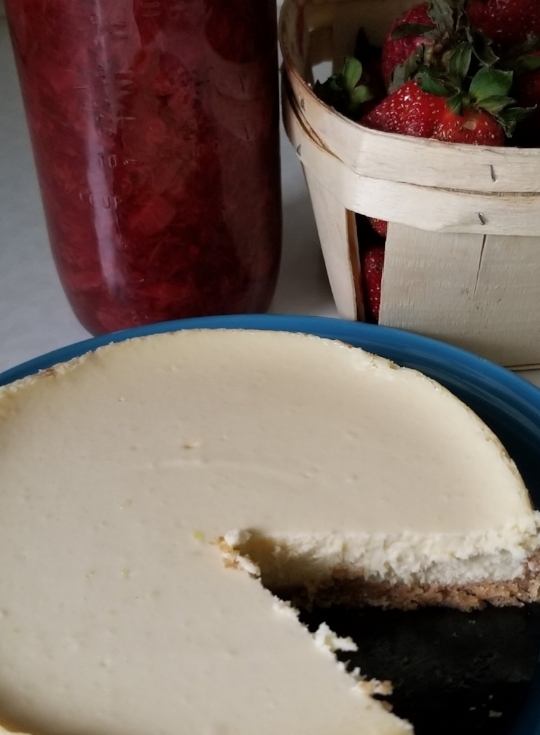 So far, my health is reasonably good while on my cheesecake only diet. I realize that eventually there is the potential for me to have some nutrient or vitamin deficiencies, but so far so good. If it’s not broke, don’t fix it, right? I’ll know when I’m dead there is a problem. Sounds a bit dramatic and crazy, right? That’s what I think when a grower tells me they only use compost. Be upset with me, tell me that it’s working just fine for you, justify it all you want but that is how you are feeding your soil and your plants. You are feeding them a nutritionally imbalanced diet that even though you are intensely rotating crops things will eventually catch up with you. In reality, you are not feeding them; you are amending the soil. You are changing the physical characteristics of the soil while ignoring the nutritional needs of the crop because compost is an amendment, not a fertilizer. Let me ask you a question. Would you eat like that? There seems to be a more significant number of farms starting in the business. A farm up the road has been composting for several years, another in the opposite direction is now offering its own brand of compost, and local municipalities in the area have started some windrows of their own. Compost business has started as a means to handle wastes from other industries. It is available year-round and at what seems to be a reasonable price, sometimes being free for the taking. Let’s look at an average analysis of your garden variety compost. Guess what; there is no average. First, compost companies source material from a variety of places. Companies in our area use mushroom waste, or food waste, some paper-based products, some use manures, some use peat or sphagnum moss, or combinations of all of the previously listed. These inconsistencies in materials and how long it is composted lead to the variabilities in nutrient analysis. Second, the nutrient analysis is negligible due to the fact nutrients are diminished as the materials are decomposed. It is an inevitable part of the process, leaving you with an amendment intended for adding organic matter and microbes. I am not bashing the industry. A vendor questioned me after a presentation about this very subject, and they have yet to get the information I asked for. I wanted analysis and data showing me what’s in their compost. That’s it, that is all I asked for. What I got were marketing talking points that I later saw on their website. That’s all you see from any of them. I’m not singling out any one company or manufacturer. They are all doing the same thing. Go to the US Composting Councils’ Website. You get a lot of marketing points, but I had to spend an hour digging for some hard-core research, and it turned up useless for any grower I’m working with. Do your due diligence and look into the source of the compost you are considering. Better yet source it from a reputable manufacturer or farmer that is willing to disclose what is in it and what the analysis is, making sure a reputable lab did it. Composting your food and lawn waste is a great idea, however, to be done successfully it can be labor-intensive and time-consuming. The volume at which you need to compost can be prohibitive as well. If applying 1 inch of compost on a 30X30 garden that is almost equivalent to 2.8 cubic yards. You would need anywhere from two to three times that volume in initial waste materials to produce that. I’ve worked with several farmers that have tried to compost and farm and cannot find enough time to do either the justice it deserves. I have personally tried the cheesecake only diet, and I’m here to tell you it did not turn out well for me. I gained 75 pounds, and I ended up back in my fat pants. I am tired and cranky most of the time unless I am medicating with coffee or another form of therapeutic beverage. I am on the verge of exploding if I do not make changes. I have radically amended my physical characteristics while ignoring any nutritional needs I have. I’m on the brink of a health crisis if I don’t change. Over the past few weeks, I have decided to get back to eating a balanced diet that consists of healthy proteins, fats, vegetables, and fruits. I have given up one therapeutic beverage except for coffee. My fern leaf peony and coffee will be buried with me. I am exercising on a regular basis and getting my family involved. As much as I love cheesecake, I have had to eat a more balanced diet. I have to find a balance between changing my physical characteristics and my nutritional needs using exercise and food. Guess what – Your soil and plants need a balanced diet as well. Your soil and plants will eventually send out signals just like what happened to me. They will not end up in their fat pants, but they will be tired and cranky. Yields will start to go down, plants will start and look unhealthy while being subjected to higher insect and disease pressure. An unhealthy plant is an open door to unwanted issues. I often hear “Well I rotate, and that ensures the plants are getting what they need.” You do have a point, but if you rotate into a crop that wants a nutrient that isn’t there because you might have overlooked nutrient removal from the previous crop? Then what do you do? Just as I have to use exercise and food to be healthy, you need to use management strategies and inputs to balance soil and plant health. Truth, I don’t want you to kick the habit entirely. I want you to use compost for what it is best suited, and that is an excellent source of organic matter and microbes. I want you to use it when it is needed to enhance your fertility program, not be the main component of it. -Get a soil test that includes organic matter. A comprehensive test that includes significant nutrients N-P-K, along with trace minerals and organic matter will be the best investment to understanding what your soil needs. -Look your farm on the soil survey website to identify your soil type. Understanding your soil type will help you learn how to work with the soil you have. -If using compost ask the manufacturer for a lab analysis done by a third party reputable lab. If they can’t provide one, you have to decide if you want to take the risk or look for a reputable manufacturer that can provide a current one. Before purchasing it take a minute and smell it. Smelling it may sound odd, but how compost smells can be an indication as to how well it is broken down and how healthy it is. Just because you are working with the rotten stuff, it shouldn't smell rotten. If it has been composted adequately, it should smell fresh and earthy.